As WordPress is going to be our CMS of choice, there are some basic settings we should apply. Although WordPress is actually very good ‘out of the box’, these basic changes will make it even better, and help you to build a quality Amazon Associates website. First, then, login to your WordPress Dashboard using your username and password. All the various settings can be accessed from the column on the left-hand side. It’s here that you can access the many features of WordPress. The first thing you’ll want to do is to stop the search engines finding an empty website. To do that, simply click on Settings > Reading and look at the bottom of the page. There, you will find a tick box that says “Discourage search engines from indexing this site.” Tick that box and then click ‘Save changes’. When we come to launch the website, we’ll come back here and remove that tick. For now, though, we don’t want the search engines crawling and trying to index an empty website with no content. 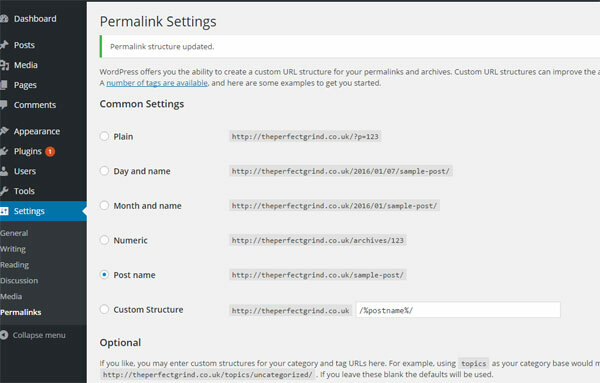 Click on Settings > Permalinks. The way that a URL appears is important on a website. Ideally, you want it to be short and simple to understand. The standard setting on WordPress uses a day and name, followed by the name of your post, which is a bit long and unwieldy. For search-engine purposes it is better to change this to Post name – so tick that box, scroll down to the bottom, and save your changes. When WordPress was installed, it created a sample post and a sample page. We’ll delete both of these by going to the left-hand column and clicking on Posts > All Posts. You’ll see a post with the title ‘Hello World’. If you hover over the title, then underneath, you’ll see a drop-down menu – in there is a tab labelled ‘Trash’. Click on that to delete this post. Similarly, click on Pages > All Pages and you’ll see a page entitled ‘Sample Page’. If you hover over the title, then underneath, you’ll see a drop-down and in there you will see the ‘Trash’ tab. Click on that to delete the Sample Page. Click Appearance > Widgets. You will see a section called ‘Sidebar. We are going to remove Recent Comments, Archives, and Meta – click on the drop-down arrow beside recent comments and then the Delete button. Repeat that for the Archives and the Meta widgets to remove those from the sidebar. 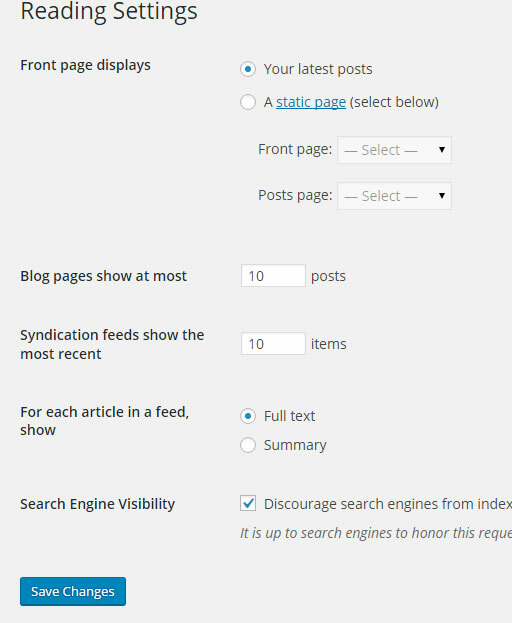 You’ll be left with three widgets Search, Recent Posts and Categories. 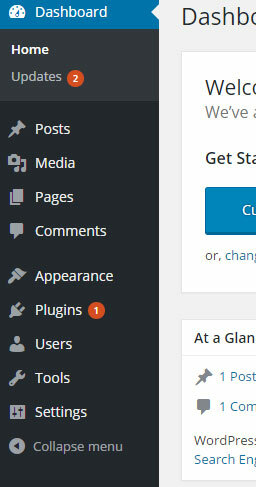 That’s all of the basic WordPress settings completed. If you now go to the top-left-hand corner of your dashboard, you’ll see your site name and an icon that looks like a house. Hover over that and you’ll see a ‘Visit Site’ link. Click on that to see what your website looks like right now: it should look like the one in the image below. This still doesn’t look like a website, as there’s no content, no theme installed and so on. 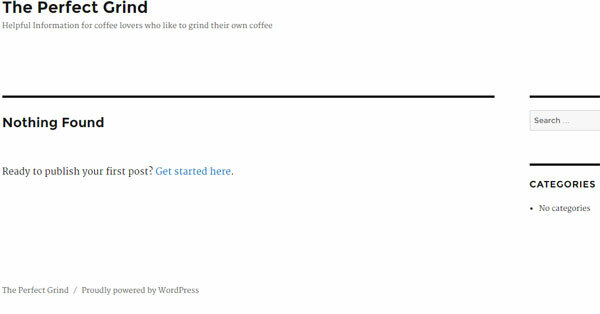 What you now have is a very clean, blank-slate version of WordPress installed. You’ll also notice that the ‘Recent Posts’ widget has disappeared, but don’t worry – that will come back when you add your first post. WordPress is a very good CMS, but by adding a few tweaks as I’ve shown, you above can make it even better. 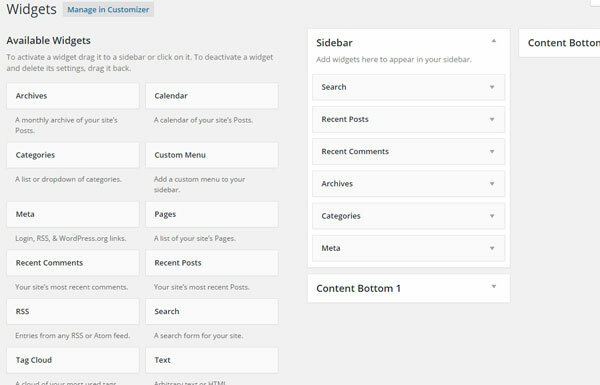 By removing the sample page, the sample post and the three widgets on the sidebar you have created a very clean version of WordPress. We’ve made our site search-engine friendly by changing the permalinks setting to ‘Post’. We don’t want the search engines looking at an empty website, which is why we hide it from the search engines until we add some content. Once the content is in place, we’ll come back and untick that box to make the website go live online. Now we need to look at basic website structure, which is covered in the next article.